Buying a stock of a company is like becoming one of its owners. Buying the stock of a company is like becoming one of its owners. Therefore, it is imperative that the 'shareholder' follows a routine to make sure 'his company' prospers. 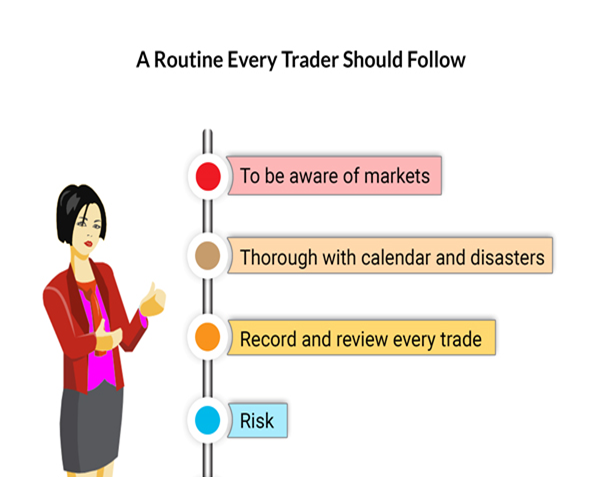 Here is a list of things that traders should involve in their routine. The market fluctuates daily. These fluctuations depend on economic factors, the performance of the company, and public sentiments. One must be aware of the changes happening in the market to make proper trading decisions. A recent example is the advent of electric cars in India. The government is aiming for electric vehicles in the future. Therefore, it is probably the right time to buy stocks of a company that manufactures car batteries. In the case of day traders, he/she must wake up early to research the latest changes. A trader must have a detailed calendar of events. Festival and seasons have a significant impact on major markets. Hence, the trader must know and understand the right time to invest in the stock market. A common example would be investing in gold during Diwali. People buy gold just before Diwali and sell it at a higher price during the season, thus making profits. Also, natural disasters and terrorist attacks have a negative impact on the market, which the trader must be aware of. Consider that after a good experience in the field of investments, the trader decides to invest in multiple markets like derivatives market (be it options trading or futures trading), tax-saving bonds, tax-saving mutual funds, and the share market. You will either make a profit or a loss. If the trader maintains proper records of every trade, it will help him analyze the right time to invest. If not followed properly, the losses will be severe. Hence, the trader must develop a trading strategy and work on it. Investment in markets is an open invitation to risks. The financial risk must range between 1% and 3%. Daily, the trader must check that none of its trades have crossed the financial risks, stop loss, and profit levels. The solution to reducing these risks is diversification. Though the risk will not ultimately become zero, it will inevitably reduce.